Tommy John was a professional pitcher that played from 1963-1989. While he had a successful career, he is most well known for the surgery named after him. He was the first player to have ulnar collateral ligament (UCL) surgery. The surgery was performed by Dr. Frank Jobe in 1974. Before that first surgery, a UCL tear had ended many careers. However, Tommy John had the UCL reconstruction surgery and was able to successfully return from it. He went on to pitch 14 more years in Major League Baseball (MLB) after his surgery. Now, UCL reconstruction surgery is known as Tommy John Surgery and has become a very common occurrence in the MLB, especially among pitchers. The number of pitchers in the MLB that are having to get Tommy John Surgery is growing tremendously. From 1974-1994 there was a total of 12 MLB players that had the procedure done. After that, the number of surgeries climbed drastically. 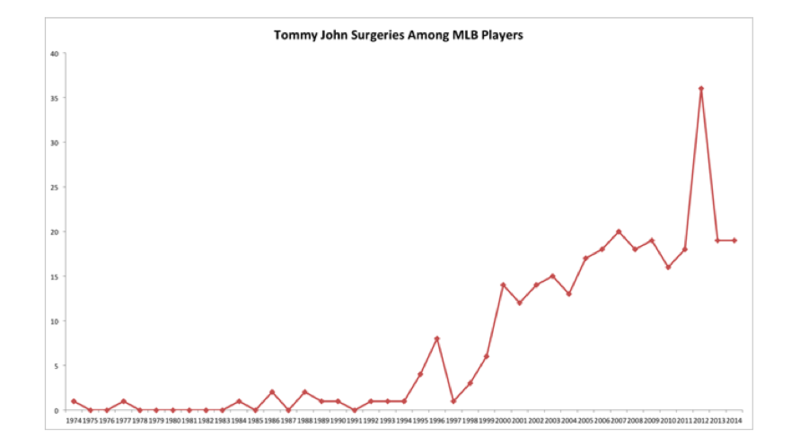 In the next 5 years (1995-1999) there were bout 22 Tommy John surgeries performed on MLB players. In the next 12 years (2000-2011), there were 194 surgeries performed on MLB players alone. There were another 275 surgeries performed on Minor League (MiLB) players during that same time span. In 2012, there were 36 Tommy John surgeries on MLB players. Then in 2013, the total decreased to only 19 MLB players that needed their UCL reconstructed. However, in 2014, there were 19 surgeries by May. That is not even half way through the season. UCL injuries are happening quicker than usual as well with, “the average number of pitchers needing surgery before Opening Day from 2000-2013 being only 2. In 2014, there were 7 before Opening Day and another 4 within the first 9 days of the season” (Stark, 2014). There are at least two reasons that can be attributed to the rise of UCL injuries. First, youth sports play a huge factor. Kids aren’t playing as many different sports as kids used to play. In the past, kids would play baseball, football, basketball, and any other sports that they could. Nowadays, kids specialize in a sport. If a kid is specializing in baseball, that means that they will be more likely to throw year-round and never give their arm a break. The kids are throwing through fatigue and the arm never gets a chance to recover properly. If a player does this year after year, it puts too much stress on the arm and causes injury. Next, average velocities are climbing every year. Before, it was very rare to see someone consistently throwing in the upper 90s range or hitting 100 miles per hour. Nowadays, it is very common to see MLB players throwing in the 95-100 miles per hour (mph) range. Also, there is multiple players that can throw in triple digits. But, with higher velocity comes higher force and strain that is put on the arm, specifically the UCL. And a lot of times, these hard throwers don’t have the best mechanics. Having improper mechanics will put strain on the arm no matter how hard the player throws. It just puts extra strain on the arm when the player throws at a high velocity. Dating back to as recent as 2003, there was 0% of pitchers that had an average fastball of over 96-mph. In 2014, there was about 5% of pitchers that averaged over a 96-mph fastball. UCL tears have become a common injury among baseball players, especially Major League pitchers. More pitchers are having to get Tommy John surgery every year. Players are getting bigger, better, and stronger each year. However, with that extra strength comes the risk for more injury and the need for preventative steps need to be taken more often.